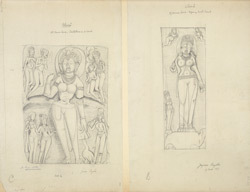 Illustration of sculptures from Dhumar Lena, Cave XXIX at Ellora from James Burgess' 'Original Drawings [of] Elura Cave Temples Brahmanical and Jaina, IIII.' The spectacular site of Ellora, in Maharashtra, is famous for its series of Buddhist, Hindu and Jain cave temples excavated into the rocky façade of a cliff of basalt. The works were carried out under the patronage of the Kalachuri, the Chalukya and the Rashtrakuta dynasties between the sixth and the ninth centuries. Dhumar Lena, cave XXIX, is one of the earliest caves of the Hindu series can be dated to the Kalachuri period of the early 6th Century, due to its similarity with the Elephanta cave. Illustrated on left is a sculpture in the south court and on right a figure in north court.